Following a hatch, clouds of insects fall to the water and sink. Wet flies were designed centuries ago to imitate drowned insects, and they still work well for this purpose. 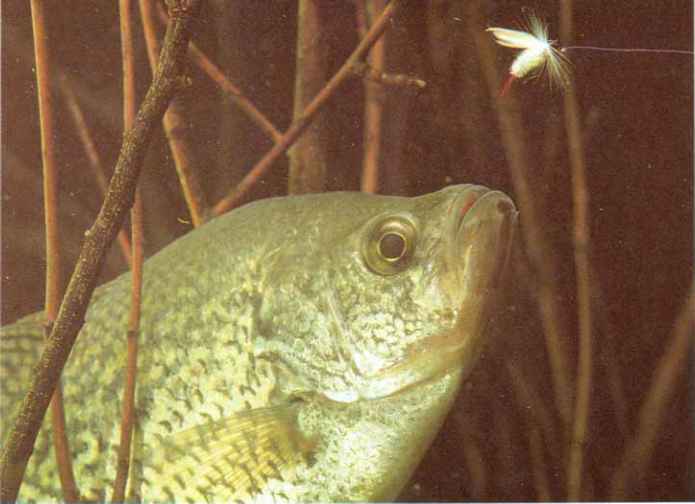 Some wet flies have no wings and imitate crustaceans, or immature aquatic insects just prior to hatching. Patterns tied with tinsel and iridescent feathers resemble minnows. 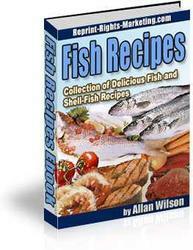 Other patterns do not imitate natural food, but attract fish because of their bright colors. The best wet flies are tied on relatively heavy hooks using soft, absorbent materials. They sink easily and the hackles and wings have a lifelike action when you twitch the fly. Feather wing - The wings, made of hackle tips or other feathers, irnitate the wings of an adult insect. Feather-wing patterns are less durable than hair wings. But they sink faster and have more action, especially when retrieved with a jerky motion. Hair wing - Some of these flies imitate adult insects or baitfish. Others are simply attractors. Because hair is buoyant, the hooks are often wrapped with wire to make the flies sink. Some have wire wound over the body or brass beads at the head. Because of their durability, hair wings work well for steelhead. 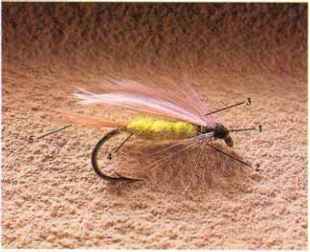 Hackle fly - These flies lack wings, but have a full hackle collar. They imitate immature aquatic insects. They sink quickly and have good action when twitched through still water. 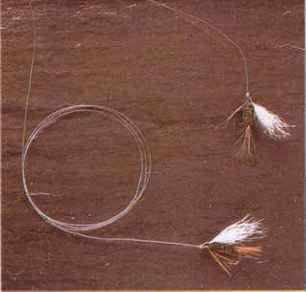 Palmer-hackle fly - Another wingless type, these flies have hackle wound over the entire length of the body. They resemble immature aquatic or terrestrial insects, or crustaceans. Like hackle flies, they work well with a twitching retrieve. Salmon fly - Most of these flies do not imitate real stream life, but rely on their bright colors to attract fish. Good salmon flies are expensive because they are difficult to tie, and many patterns call for rare materials which can no longer be legally imported. 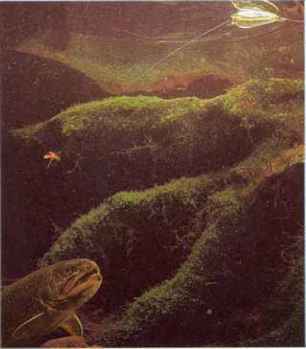 Nymphs, streamers and bucktails are sometimes included in the broad category of wet flies because they are also fished below the surface. But each of these specialized types will be considered separately in this book. POPULAR TYPES of wet f1ies include: (1) feather wing, (2) hair wing, (3) hackle f1y, (4) Palmer-hackle f1y and (5) salmon f 1y. Wet f1ies Tay be fished with a (6) tiny spinner in front for extra f1 ash. CAST a wet fly along the edge of a weedbed or into a depths to find the fish. Retrieve slowly, with long, smooth pocket to catch panfish. Let the fly sink, trying different pulls or gentle twitches. 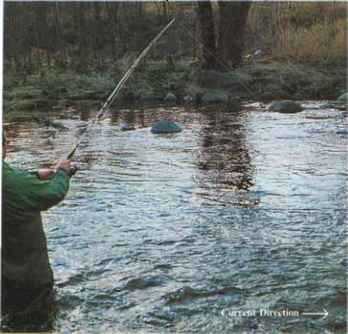 At the turn of the century, wet flies were the only type used in North American waters. They became less popular as other types were introduced, but they remain as effective today as ever. 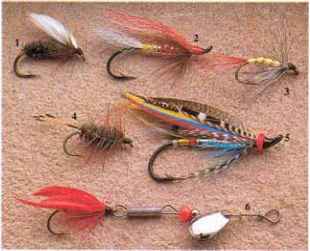 Wet flies are most commonly used for trout and salmon, but they work equally well for panfish, especially crappies and sunfish. 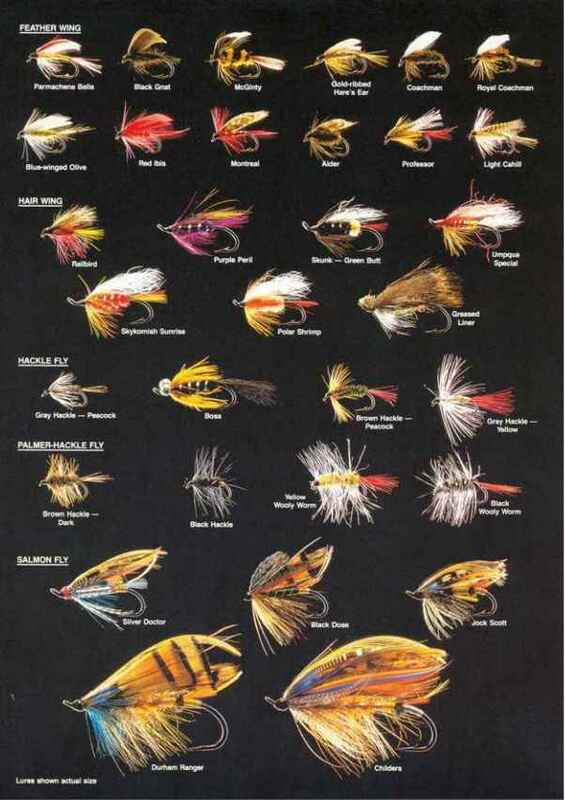 Wet flies in sizes l0 to l8 work best for most trout, sizes 2 to 8 for steelhead and salmon, and sizes 8 to l2 for panfish. Presenting a wet fly requires less finesse than other types of fly fishing. You can angle your casts upstream and mend the line if necessary for a drag-free drift, as you would when fishing a dry fly. You can also retrieve the fly across or upstream. Or, you can allow it to swing into downstream pockets on a tight line, directing the fly by pointing your rod at the spot to be fished and letting the current catch your line. A drag-free drift is essential only when fishing a wet fly to imitate a drowned adult insect. 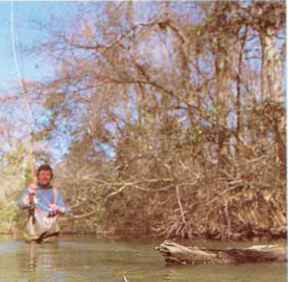 When using flies that resemble free-swimming immature insects or small minnows, retrieve your fly across or upstream with sharp jerks. A jerky retrieve also works well in slack water. You can also present a wet fly by dabbling. Simply drop your fly into an opening along a brushy bank, or dangle it next to an undercut bank to imitate an insect struggling to fly. Jiggle the fly in and out of the water, letting it sink a fraction of an inch each time. Stay low or use vegetation along the bank to conceal yourself from the fish. To detect strikes when using a wet fly, point your rod tip at the spot where the fly lands, then follow it as it drifts. If too much slack forms, you will not be able to feel a strike. Watch the line closely and set the hook if you see a twitch or notice any hesitation. A flash below the surface may also signal a strike. When fishing wet flies with a floating line, use a 71/2 to l2-foot leader. With sink-tip or sinking lines, use shorter leaders, from 3 to 5 feet long. If you use a long leader, the line would not pull the fly as deep. TIE on two or more wet flies to simulate hatching insects. Attach your tippet to the leader with a blood knot, and leave about 6 inches of the heavier line untrimmed to form a dropper. ADD twists of lead leader wrap or a split shot a few inches ahead of a wet fly for extra depth. If you need more weight, several small shot spread along the leader will cast better than one large shot. MAKE a short cast across and downstream, then hold your rod tip high, skittering the flies along the surface as they swing below you. The dropper fly bounces on the water while the other catches in the current. ATTACH a clear plastic bubble to fish a wet fly with a spinning rod. The bubble provides casting weight, yet is practica1ly invisible to fish. Position the bubble on the line according to the depth you want to fish. How to fish a wet fly on a still water? 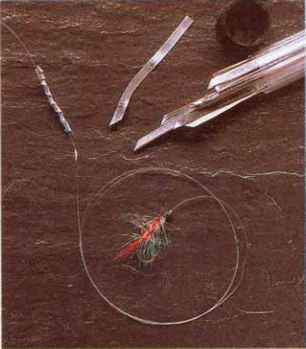 How to tie a bright wet fly? How to fish a wet fly for salmon? HOW TO STRIKE USING A WET FLY IN STILL WATER? How to tie a wet fly throat? What do salmon flies imitate? How to fish wet wet flies? What hair to use for hair for hairwing salmon flies? How to rig steelhead wet flies? How to fish using casting bubbles?